Starts : Sunday, January 4th 10am. Repeat for 4 weeks at same time. Learn the fundamentals of Tai Chi in 4 step-by-step lessons which promotes better health and calming of the mind. You will learn and practice the fundamentals of Tai Chi in 4 workshops. This Tai Chi (often written as "TaiJi") course will show you one of the most popular and beneficial forms of exercise in the world. "Learn to calm your body and mind." Get the blood and oxygen flowing ..
Tai Chi for Beginners provides you with Step-by-Step instructions building one week to the next. This Tai Chi Yang form can be done in 5 - 10 minutes. It requires no special clothes or shoes. It is also progressive. You can use these fundamentals to build on. These are the stepping stones for the Yang 24 Course (most prominent forms of Tai Chi), the Yang 48 (one of the most fun and popular forms) and QuangPing TaiJi Chuan (Martial Art of TaiJi). "Can I really learn in 4 classes?" We keep workshops small in number so that you can get personal attention that you many need. "I have memory problems, dementia or alzheimer's, can I learn it?" 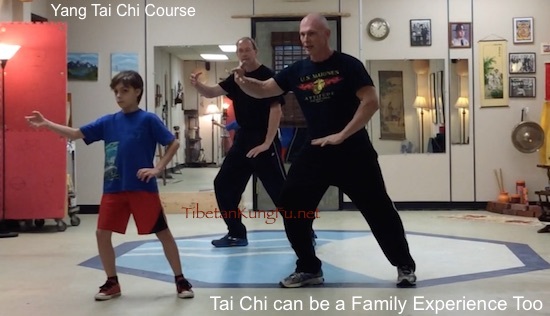 Our Yang 9 Tai Chi is short enough so that most folks can learn it with practice. "I am out of shape, can I do this?" Yes, this is designed to be mild enough for cardiac, arthritic and people with health concerns. "I am totally inexperienced, is this okay for me?" Absolutely, this course was designed to give you small chunks over 4 weeks so that you can learn gently. Why Learn here, rather than in a commercial martial arts school? We want you to have a great time and be successful. How can we say that, and not give you further encouragement to practice? We take to heart your time and effort spent with us. 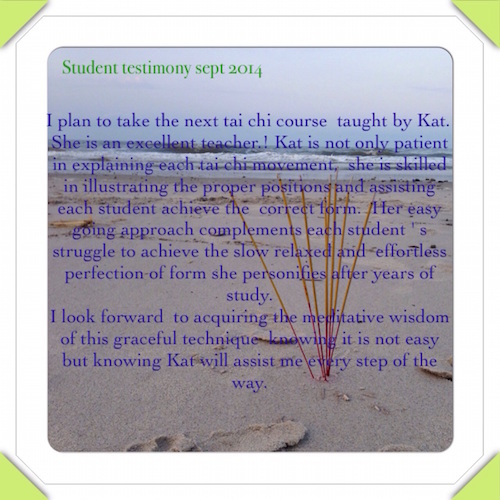 While you are enrolled in your Tai Chi Course, you may come to practice once per week. AT NO ADDITIONAL COST. 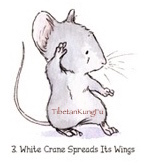 Copyright 2004-2015 Tibetan KungFu and RiverWell Inc.